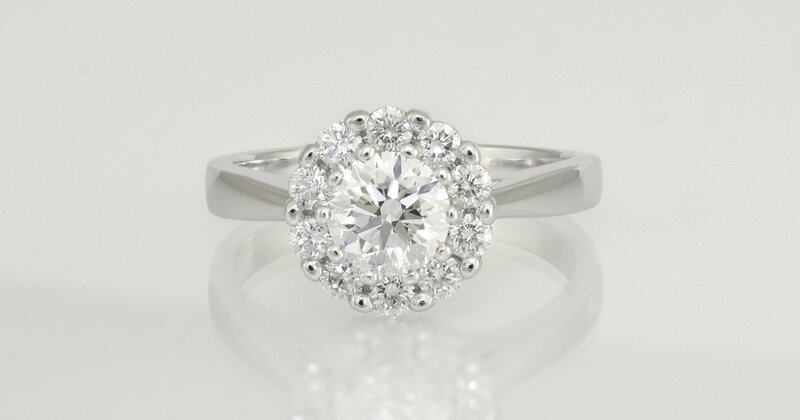 One of the most common starting points for an engagement ring is a photo of a design seen elsewhere. Almost always after modifying the design to the customers preferences we end up making something quite different. I was given this photo and a budget and asked what I could make within the latter. After discussing the customers preferred quality of diamond and precious metal I submitted details which were accepted. First part of the design process was to layout the halo reflecting the diamonds we were using and the intended finger size we thought we were going to use ay the time. This article explains why this step is so important. 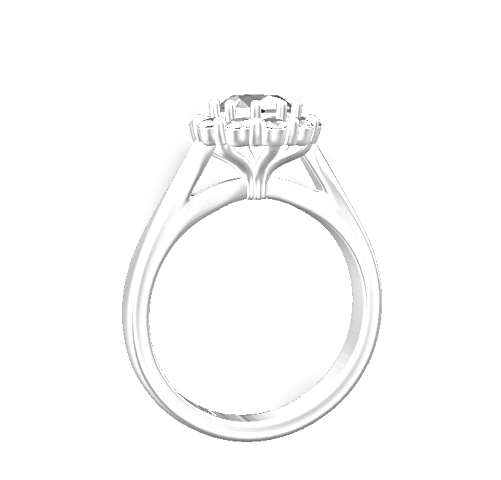 The design scaled to the diamonds to be used at the bottom. Next we looked at our options for the band width and shape. I showed some options to the customer and he chose number 2 from below. I edited the design to reflect all of the changes. These were approved and we were ready to proceed to the draft stage. Clear passage for a straight wedding ring. 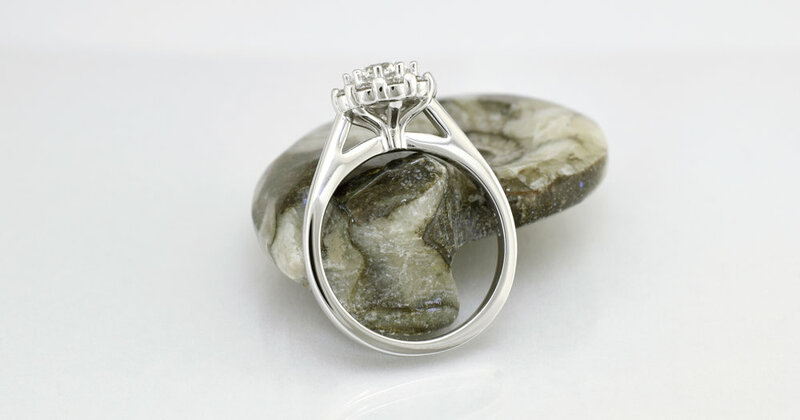 Existing customers and those that visit my site often know that I make a draft in silver for final approval prior to making the actual piece in the precious metal of the customers choice. 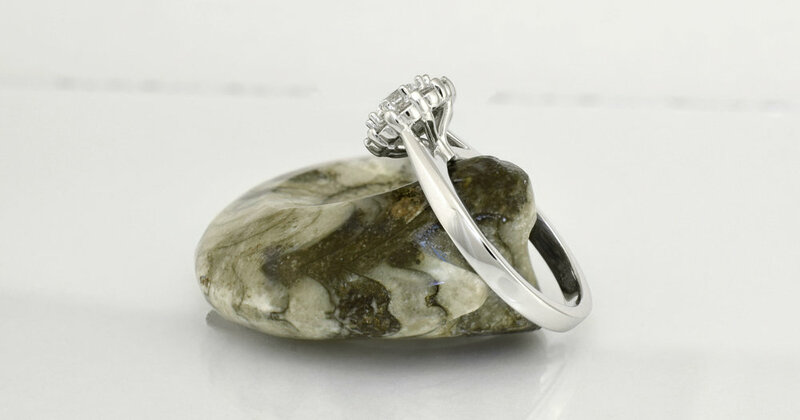 However this ring was to be used for a surprise proposal so feedback from the recipient would not be possible for now. I made the draft in 18ct white gold and it will be used for the proposal. If after the proposal the size is wrong or there are some changes that the recipient would like to make....the ring will be remade. You will notice in the photos below the halo looks larger than in the design mockups above. That is because after some further secret research we decided to make the ring a smaller finger size. As you read in the article about hand models earlier in this post a smaller finger size makes the diamonds look bigger in a photo. The proposal was accepted! She loves the ring and we were lucky enough to get the finger size very close. I will see the couple together for the first time in a month when the ring comes in for it`s one month free checkup and clean. Same design, well sort of.